Polish your panes with a fresh cleaning approach that has met the needs of over 94% of our clients in Islington! Q: How will the window cleaning clean my property? A: We can quickly remove splashes with either external window cleaning (for four-storey properties), rope access window cleaning (for multistorey properties), or via the usual manual cleaning of interior panes. Q: Can you tell me a tad more about your water-fed rod cleaning method? A: Of course! This cleaning tool can stretch up to 22 metres in length, allowing the experts to effortlessly reach and scrub even the farthest corners of your glass surfaces. Q: Why don't you shine the panes with your water-fed rod? A: Our water is distilled from any residue-causing minerals. When this fluid evaporates under the sun, it won't leave any smears behind. A: Rainwater is usually clean, so it won't deter us from doing our responsibilities. However, while we won't mind a slight drizzle, a sudden rainstorm can result in unsatisfying results. During thunderstorms, we may have to put off our service for a day of your preference to ensure the team's safety. Q: Do I need to wait in my premises until the service is done? A: No, the practiced window cleaners in Islington can easily perform exterior window cleaning without you being around, as long as your property gates are unlatched. And if you want your casements to glitter on the inside, just schedule our complimentary key pick-up and delivery option instead. For the last ten years, our window cleaning Islington service has always brought satisfactory results at the most fair prices in your area. You can browse our prices in our convenient price table below. 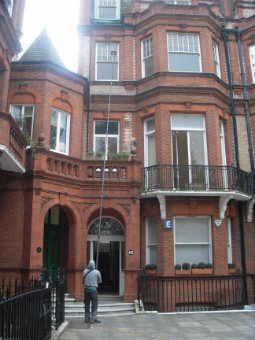 We've designed our window cleaning in Islington with versatility in mind. As a result, our service is now frequently booked by commercial and residential clients alike. Let's have a look at our window cleaning choices on offer. With our external cleaning, you can deftly polish the windows of any property with four or less floors. The proven experts will appear in a cleaning caravan. The window cleaners in Islington will then link a convenient water-fed rod to the van's water container. The special purified water will be pumped through a brush-head installment at the pole's end under powerful pressure. When the fluid vanishes under the sun, your glass façade will stay clean for weeks to come. For buildings above the fourth floor, we'll send experienced climbers for rope access window cleaning. Using durable ropes, cherry pickers, and ladders, they will assess and renew any high-rise domain over the course of one afternoon. Should you require risk assessment reports, we'll happily provide them for you. We also take our tasks to heart and will abide by all safety regulations. If your windows are smudgy on the inside as well, the experts can perform interior cleaning with ladders and squeegees. As our client base grew in numbers, we introduced our window cleaning in Islington to include other London districts as well. Please refer to our concise list to discover which adjacent locations we visit. Alternatively, get a free instant quote or order affordable window cleaning services Islington N online, through our web site.